We provide stage hire for every type of event, from live gigs and band performances to catwalks, festivals, promotional stands and corporate events. Our stages are modern and sleek making us the perfect choice for corporate event staging, opening ceremonies, presentations and award ceremonies. We offer a complete event production service to include PA hire, staging, room lighting and more. If you'd like to find out more, please get in touch with your requirements. If you're hiring a live band and are looking to make the night extra special, a band stage and full lighting rig is definitely the answer! Hire a Stage We provide stage hire for every type of event, from live gigs and band performances to catwalks, festivals, promotional stands and corporate events. Staging Hire We offer a complete event production service to include PA hire, staging, room lighting and more. If you'd like to find out more, please get in touch with your requirements. Stage Hire for Live Shows If you're hiring a live band and are looking to make the night extra special, a band stage and full lighting rig is definitely the answer! ‘Hire a Stage’ are a UK based stage hire company offering premium stage hire for corporate events, live gigs, festivals, marquee events and more. 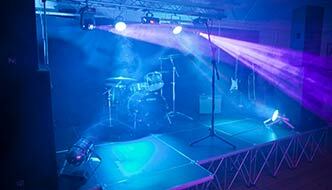 All of our stage equipment is brand new for 2013 meaning you can be confident about the quality of your stage. Whether you’re looking to hire a band stage for a live gig, small stage for a corporate event or large stage for an awards ceremony, we can provide the perfect staging for you. With 10 years in the events industry, we know how important it is to be organised, flexible and punctual which is why we offer a 100% satisfaction guarantee with every booking. For more information, speak to one of our advisers. We offer a range of staging hire options to suit any type of event. If you’re not sure about your staging requirements, visit our stage size page or contact one of our advisers. If you’d like to hire staging for an indoor or outside event, you’ll find our stages are the perfect choice; modern, stylish and upmarket, they are ideal for any type of event. For more information on stage sizes available, please email us using the form to the right. We have stages of all sizes to suit any type of event, from small stages for comedy nights and acoustic gigs to large stages for big bands and corporate events.